"If we work hard, we sleep well." These simple words distill the farming ethos of authors Shawn and Beth Dougherty, who twenty years ago purchased a small parcel of land deemed "not suitable for agriculture" by the state of Ohio. Today, their family raises and grows 90 percent of their own food on that very land. The Independent Farmstead reveals how such self-sufficiency can be achieved if you center your farming practices around intensive pasture management. Pioneered by such luminaries as Allen Savory and Joel Salatin, he tenets of holistic grazing - employed mostly by larger-scale commercial operations - have been adopted by the Doughertys to fit their needs. In The Independent Farmstead, their model for regenerating the land and growing food - "the best you ever tasted" - is described in detail for others to build upon. It's more hands-on for the farmer, and much more work, but has enormous health benefits for both the animals and the working landscape. 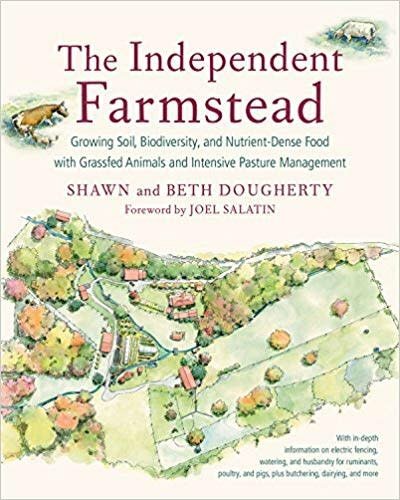 If you, like a growing number of homesteaders and farmers, feel "the desire for clean, affordable food, unmodified, unprocessed, and unmedicated," The Independent Farmstead is a must have resource. Best of all, it's the rare how-to book that the authors themselves view not a compendium of one-size-fits-all instructions but as "the beginning of a conversation," one that is utterly informative, sincere, and inspiring.